The extension of the Brexit deadline until the end of October has led to added frustration for Irish companies trying to prepare for the UK's departure from the European Union. One such firm is Irish Pressings - a small family-run company based in the Údarás na Gaeltachta Business Park in Gaoth Dobhair in west Donegal. It manufactures components for major car manufacturers such as Jaguar Land Rover, BMW and Honda. Even though Brexit has not happened yet, Irish Pressings has felt the impact of it. Honda is one of the company's main customers in the UK but it has announced it is pulling out of Swindon and moving manufacturing back to Japan. Overall, however, the automotive industry in the UK has slowed down and Irish Pressings experience has been that car companies stockpiled parts ahead of the original March Brexit deadline and also that car sales dropped. For the Gaoth Dobhair company, Managing Director Declan Ward said this meant a very busy period of work followed by a drop off in orders. As a result, he said, a number of staff had to be put on short-time work and there was a knock-on effect on cash flow and the general running of the business. The firm has its own truck which leaves Donegal a couple of times every week to deliver components to the UK. It returns with loads of steel and aluminium for its production plant where 68 people are employed. The challenge of Brexit has been the uncertainty surrounding the UK's departure from the EU and the shifting deadlines have just added to the company's frustration according to Sales and Logistics Manager Karen Campbell. She said it would be great to know what the company needs to do in terms of issues such as customs documentation for its truck. In the meantime, both Karen and Declan say Irish Pressings has decided to focus on the positive side to Brexit and refocus its direction. 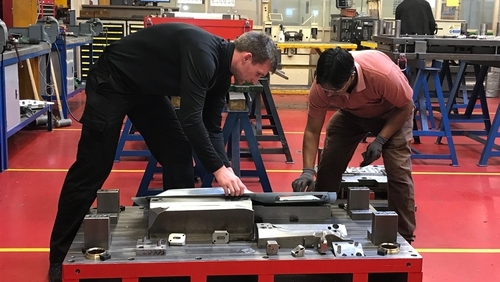 The company has been developing the tool pressing side of its business and seeking out new markets for its car components. In fact, Karen said that some companies have already decided to look away from the UK and approached them in Donegal to quote for contracts. At the moment Irish Pressings is exporting to countries such as Poland and is actively pursuing business in Mexico and Russia. Whatever the outcome of Brexit it seems that it will ultimately see this small company have a much greater global reach from the Donegal Gaeltacht.